and on and on and on…..When will it end, this relentless hot summer weather and lack of rain? One thing I usually like about gardening is the variety of tasks, but I am beginning to wonder – all we seem to be doing is watering! And while this can be a relaxing and contemplative activity for a while, it soon becomes monotonous when it is similar to painting the Forth Bridge! Despite the unforgiving weather there is still lots to celebrate. 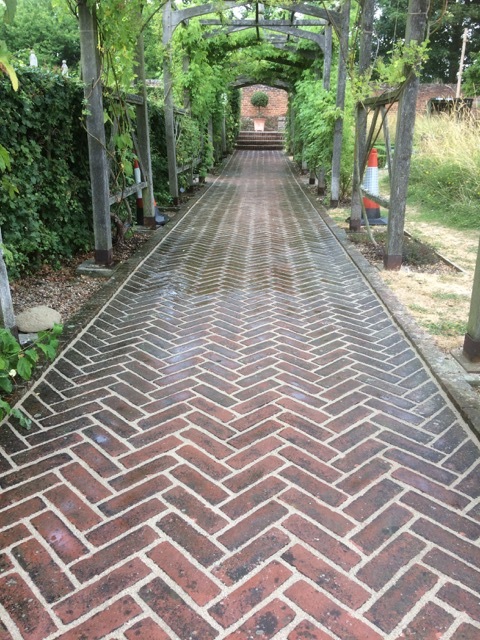 The next phase of our heritage lottery project has been completed and the paving under the arbour is now repointed and looking much smarter. Wouldn’t it be wonderful to see the rest of the paving restored in a similar fashion? Not only does it mean the use of far less weedkiller, it also makes the paving less of a hazard for our high heeled wedding guests! 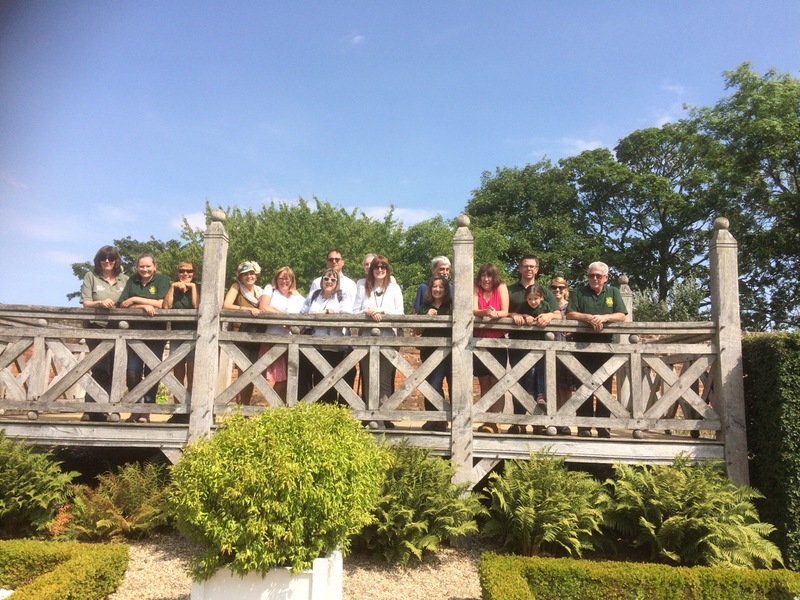 Our volunteers went on a very enjoyable outing to Green Island Gardens near Ardleigh recently. The gardens are professionally designed by its owner Fiona Edmond, and are laid out as a series of structured gardens displaying a huge range of unusual trees, shrubs, perennials, and bulbs. 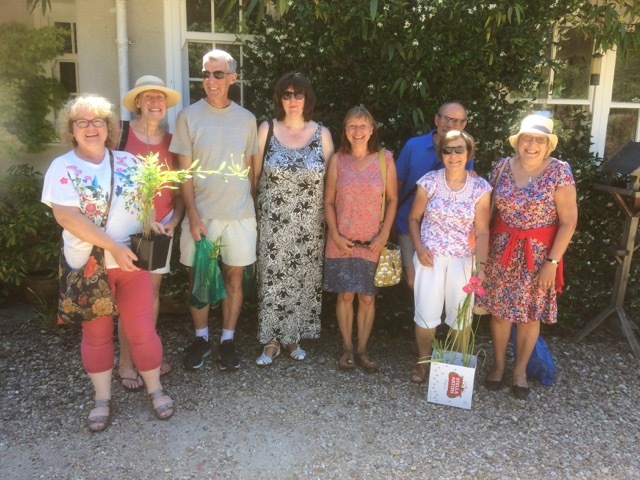 The weather was, guess what, hot and sunny, which meant we could have a warm, leisurely stroll around the grounds before ending at the tea-room for lunch. This lovely shady pergola next to the pond provided the perfect spot for a photo. An added bonus is the little nursery where we could choose a choice reminder or two of our visit. A very enjoyable day and a thank you to all our hard working volunteers. Back in the gardens they have been getting on with plenty of work to keep everything looking as fresh as possible, none more so than in the community garden where the crops are looking perky and beginning to produce an abundance of delicious fresh veg for us to take home. 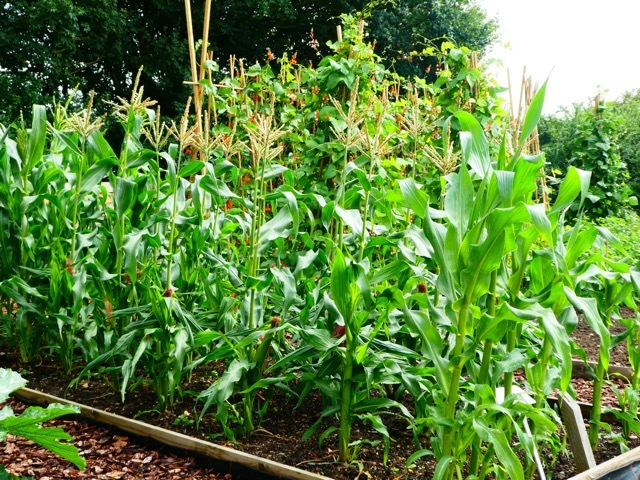 The sweetcorn just loves the heat and, providing it gets enough moisture, will soon be giving us plump, juicy cobs for our barbecues. 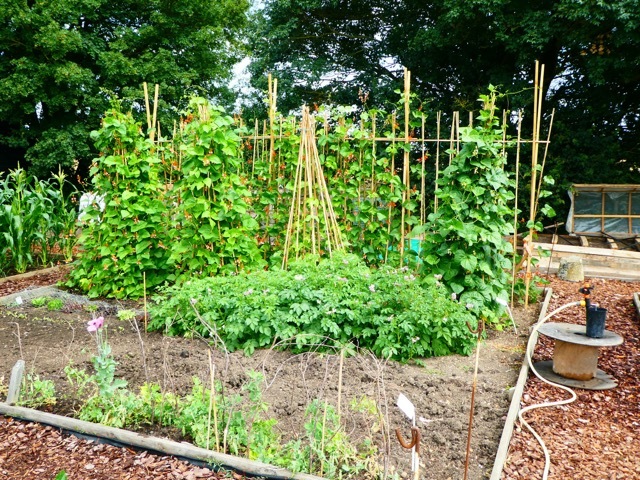 The French and runner beans are also just about ready for harvest and there will be the usual glut I am sure. This year we have tomatoes growing in a raised bed within the polytunnel which has been very successful compared to growing them in pots. The roots have more space to expand and the greater quantity of soil means more water holding capacity. The super hot, dry conditions have resulted in a red spider mite outbreak this year but it seems to be affecting the cucumbers rather than the tomatoes. 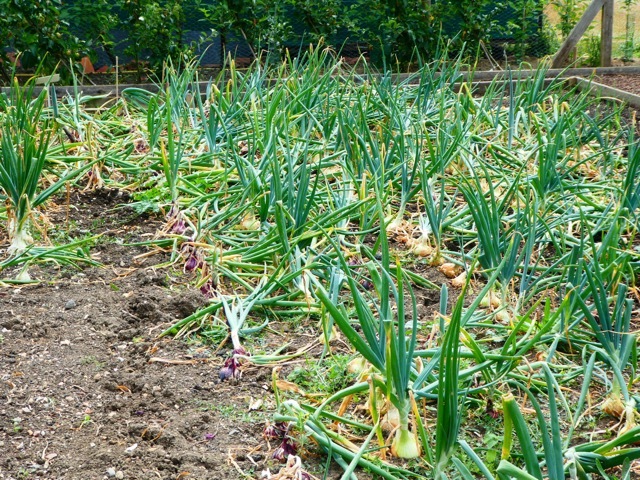 The onion crop has been very good and there are plenty available. 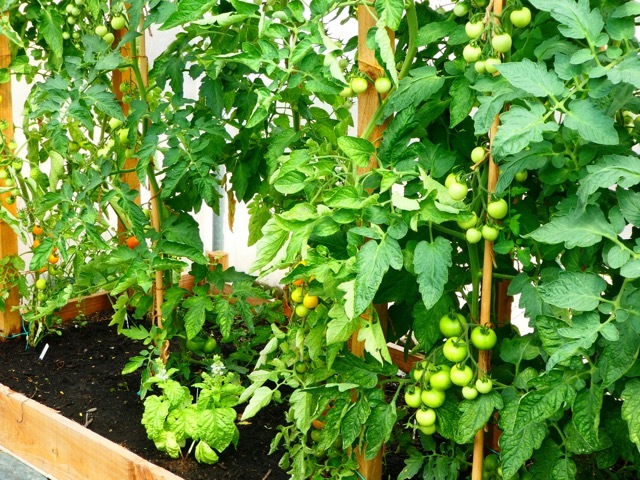 Don’t forget, you can visit the community garden on a Tuesday between 10.30 and 4.00 if you would like to see what we have growing and take some home. The veg stall will be stocked with produce every Tuesday for our visitors to sample local, super fresh, chemical free vegetables in return for a donation to our funds. 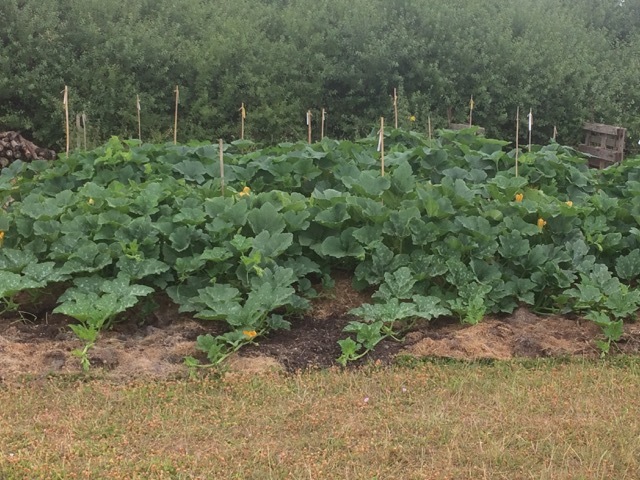 We are also very pleased with the progress of our no-dig pumpkin patch. The plants have romped away in the deep organic base made for them over the winter and they seem to be coping well with the drought conditions as a result. 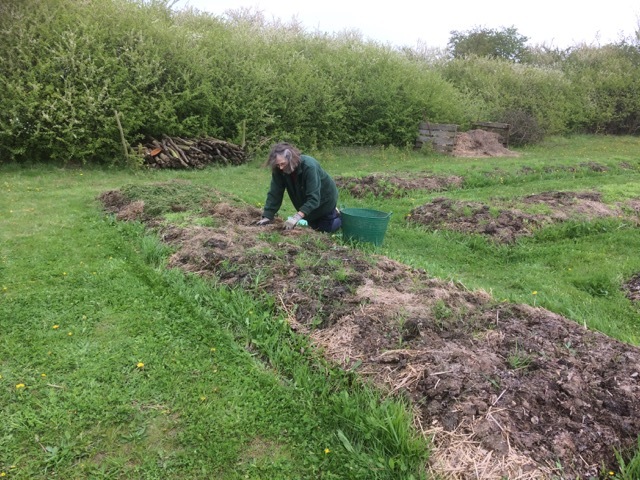 It was a bit of a struggle in early spring when the weeds and the encroaching grass threatened to engulf the beds with the rich conditions we had created! We tried various ways of keeping it all under control. But once the pumpkins got going there was no stopping them and the broad leaves provide a very effective weed suppressant. It became hard to see where one plant starts and another finishes, hence the canes to help target the watering cans! In the walled garden the two main tasks, aside from watering, have been cutting back the meadows and trimming the box and other topiary. The box maze was the first to be clipped with beautiful technique on display here from our volunteers. This poor little hedge maze is much loved by our youngest of visitors and has to suffer many a misplaced foot as they negotiate their unsteady way into the centre. In the hottest, sunniest weather we avoid cutting the box as it can scorch the cut leaves and the open wounds made by cutting can make the plant more susceptible to blight. 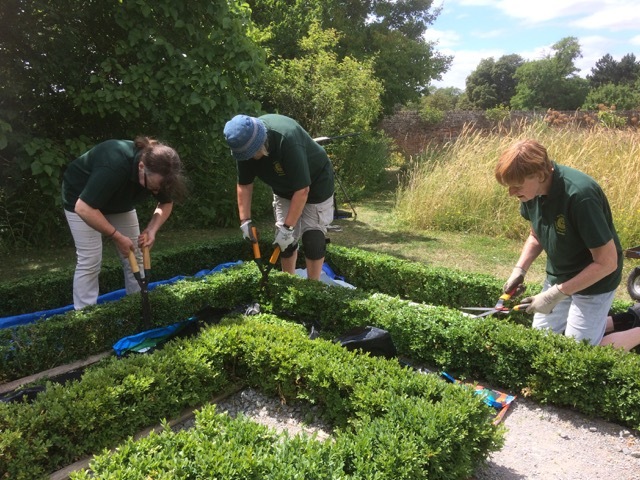 The RHS recommends delaying box cutting until August, when the new growth has hardened off and slowed down and the hedge should remain neat through the winter months. 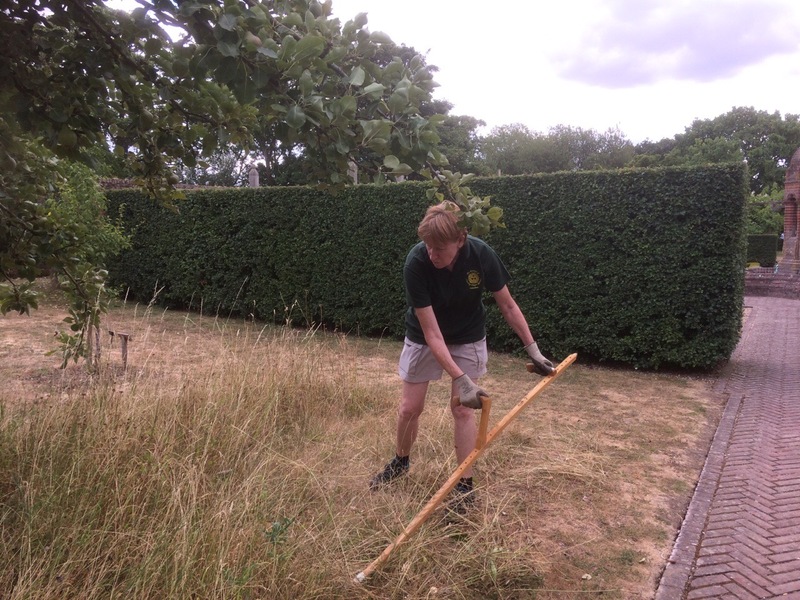 Scything of the meadow grass is a task we carry out between the end of June and the start of August. 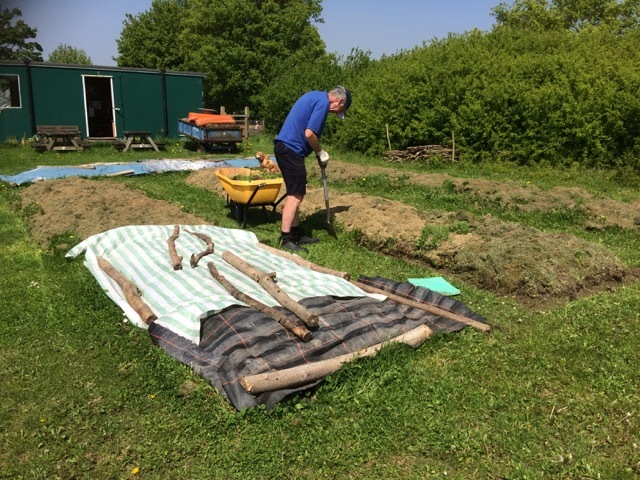 I always offer the volunteers a go at using the scythe but it is strictly a one person at a time activity! Some take to it more enthusiastically than others but it is surprising how quickly the job gets done with a tool that has been around in this country since at least Roman times. After the main cut, additional mowing or grazing during late summer and autumn is very effective in removing excessive grass growth and encouraging flowers -particularly on more fertile sites. Ideally cut at least twice from the time the hay is removed to the end of November, aiming to leave the grass short through winter. The amount of mowing required will depend on the fertility of the site; areas can be mown regularly (weekly) if a more tidy appearance is wanted. In all this heat it has been hard to find the energy to do anything strenuous but some jobs just needed to be done and thanks to our youngest volunteer, our garlic harvest is complete and the bulbs are hanging to dry for storage all winter if need be. Hot work though! 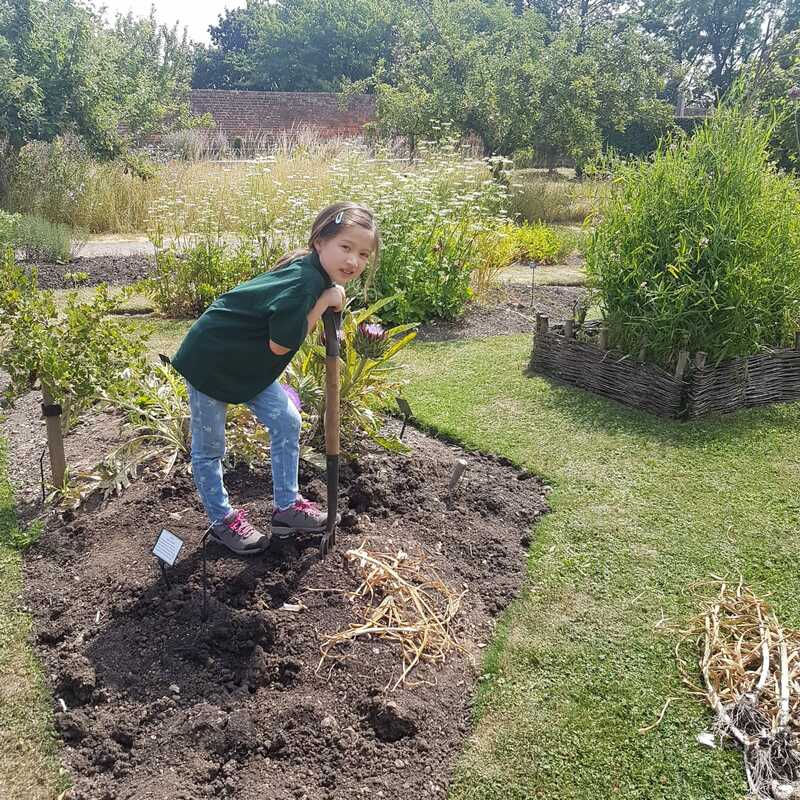 We welcome younger volunteers to help out in our gardens, so long as they are accompanied by an adult. 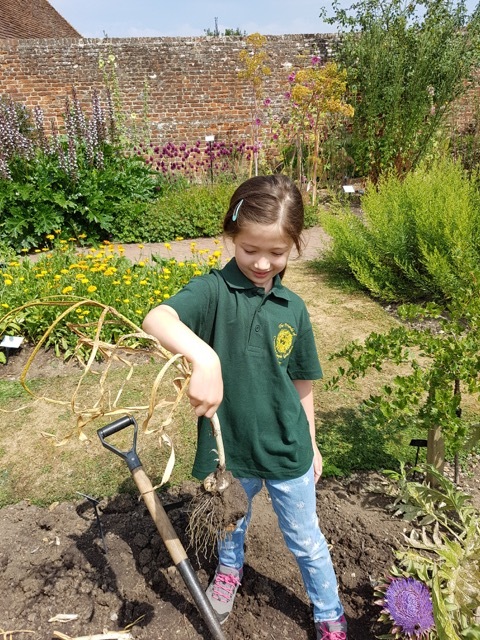 We are hoping to set up a gardening club for kids during school holidays too – contact Rebecca if you would be interested. 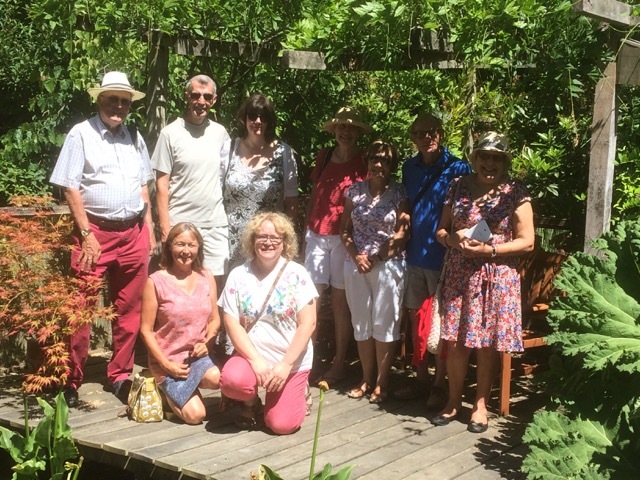 The Friends of Cressing Gardens were delighted to host a visit from Mark Carroll this week. Mark is Executive Director for Economies, Localities and Public Health, the ECC Directorate within which Cressing Temple is place. He was escorted around the site by the Trustees and shown the Jubilee Orchard, the Community Garden, the Community Shed and the Walled Garden. Volunteers were on hand to answer questions and explain their role and we all congregated in the Martin Room at the end for tea, cake and a discussion session. Everyone was keen to show what has been achieved over the years and give suggestions on what could be achieved in the future. It was a congenial, positive and thoroughly enjoyable afternoon which sets the tone for a closer relationship between the Friends group and Essex County Council in the future. many thanks to Mark for his time and his interest. As we head into another unrelentingly hot week maybe the best thing to do is to find a pond and do some wildlife watching, where there will always be something going on and something to see. 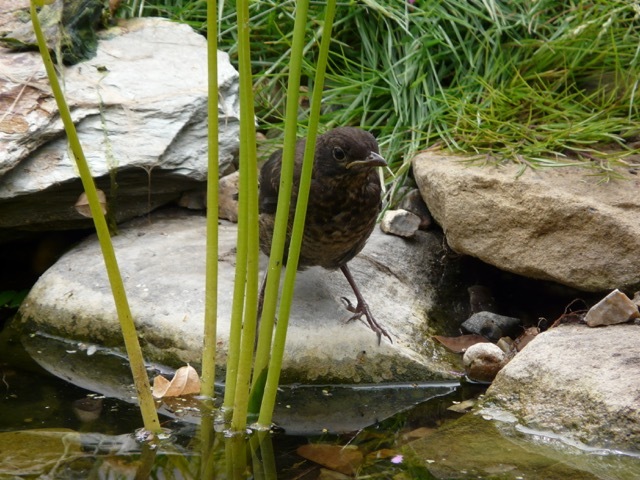 The birds have been frequent visitors to our pond at home this weekend, desperate for a drink or a cooling ruffle of the feathers. 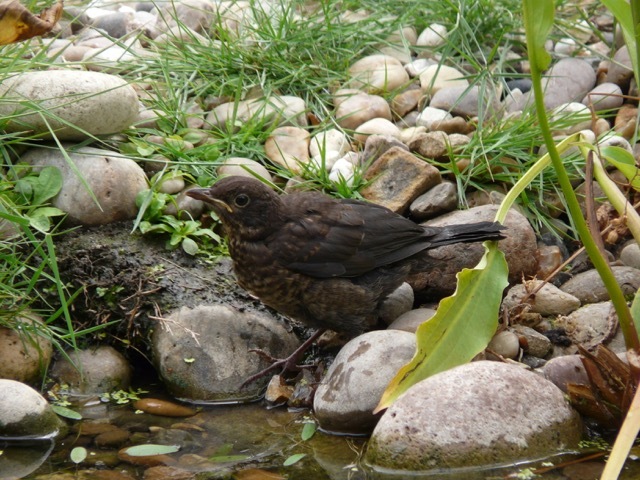 This young blackbird wasn’t too sure what to do as she fumbled her way to the water’s edge, frequently tweeting for some adult support and guidance! Teenagers eh! 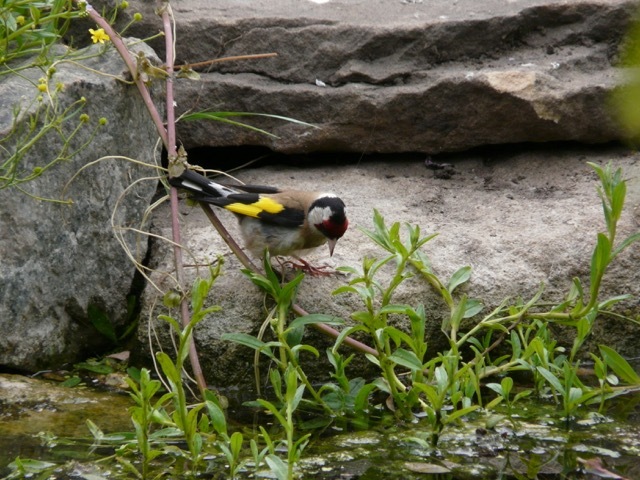 This lovely goldfinch had more of a clue, but didn’t stay long, wary of possible lurking cats and other dangers. The star of the show this weekend was a lovely Emperor dragonfly who chose our water lilies to lay her precious cargo of eggs. 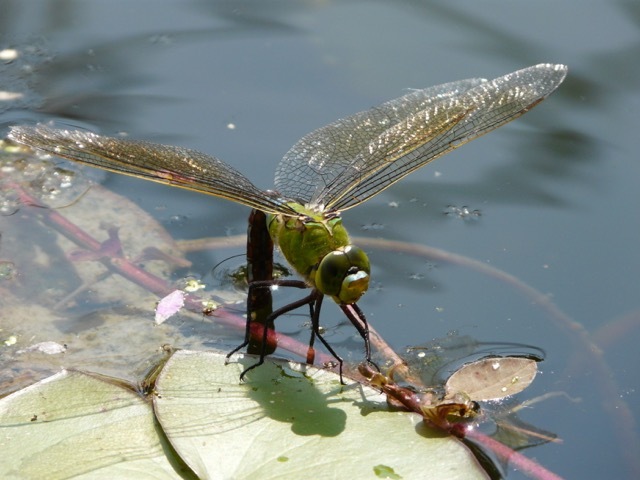 Most of the dragonfly’s life is spent underwater as larva. It emerges as a winged adult for a few weeks a year to mate and lay eggs. The female uses her ovipostor (a special egg laying organ) to lay them. To protect her eggs from being eaten by fish, she places them into slits that she has cut into stems of pondweed which is what you can see her doing in the picture above. The eggs develop in about 3 weeks, depending upon the temperature of the water. The larva, or nymph, that hatches is wingless and lives in the water. It molts (sheds its skin) ten to fifteen times during the 2 years it takes to mature. Almost all of its growth occurs in summer months. In the last stage of development the larva crawls out of the water and dries its skin in the sun. As the skin splits, the adult dragonfly emerges. Once its soft wings have hardened, it can fly. The adult dragonfly lives for only a few brief weeks. What an amazing creature. All that effort for just a few weeks of adult life! Here are a few more interesting things about dragonflies. Dragonflies always rest with their wings spread open. Dragonflies and their larvae are a popular food in some Asian countries. There are over 30,000 facets in a dragonfly’s eye. Very few birds can outfly and hunt down dragonflies. The fast flying, agile hobby is a match. The dragonfly’s front and hind wings beat alternately, not together, as with most insects. This gives them better flight control.